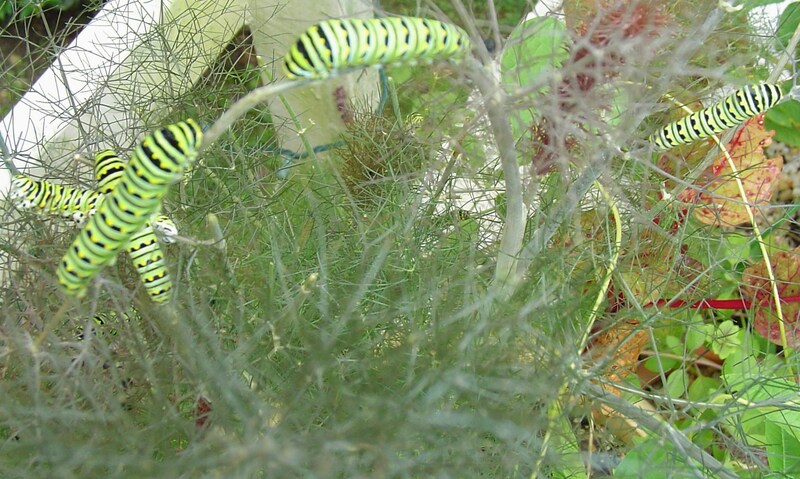 Eastern Black Swallowtail caterpillars enjoying the bronze fennel. This fennel is growing in a large pot on the deck. 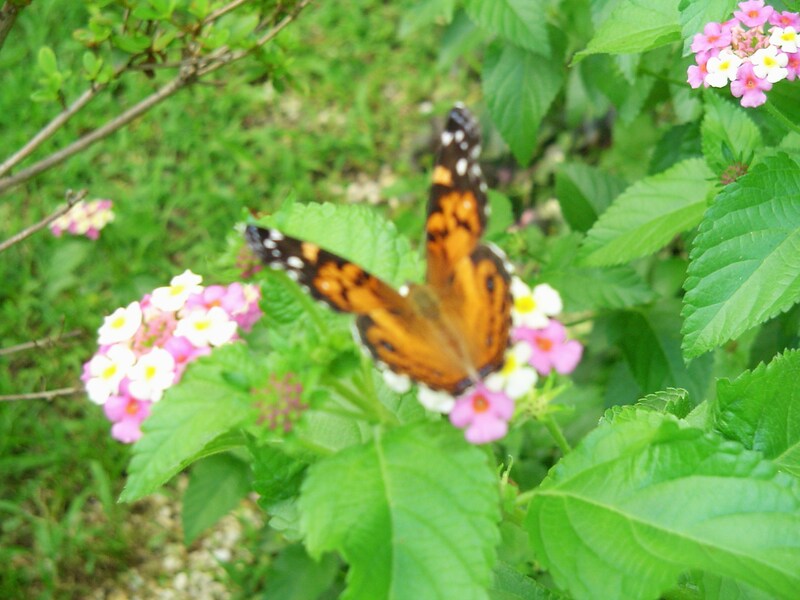 Flowers in nearby pots and baskets attract butterflies to feed. 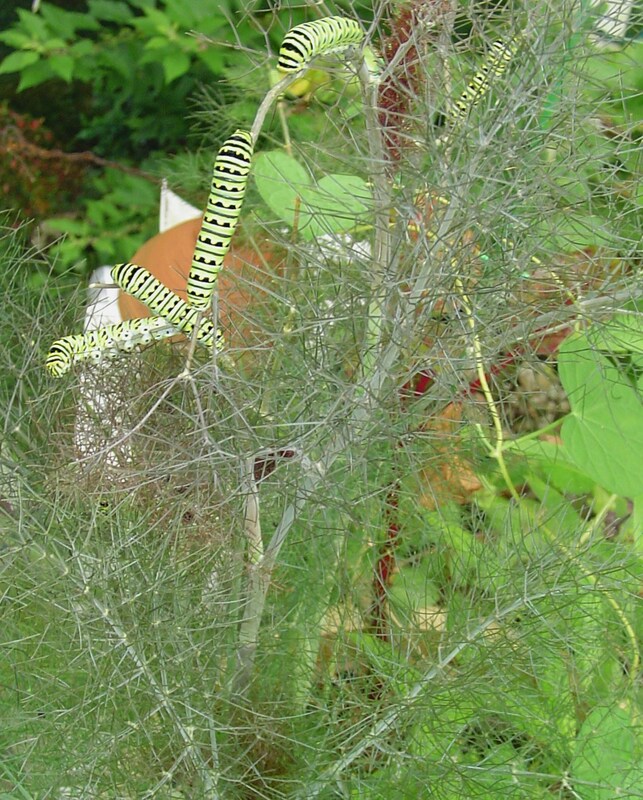 Hungry as the caterpillars might be, fennel grows quickly and will survive their munching. This Osmanthus goshiki shrub doesn’t look like a good host plant, but is on the menu for this gigantic beast. The largest caterpillar I’ve ever seen is munching my Osmanthus goshiki shrub. It may be a Tobacco Hornworm caterpillar. It is definitely a moth caterpillar. It is a almost an inch in diameter, and over 5″ long. Every hungry caterpillar has the potential to open its wings as a beautiful butterfly one day soon. Eastern Black Swallowtail butterfly drinking from a Rose of Sharon blossom. You don’t need a large garden, or even a yard, to attract butterflies and provide habitat for their caterpillars. All the plants you need to provide will grow in pots on a deck or patio. 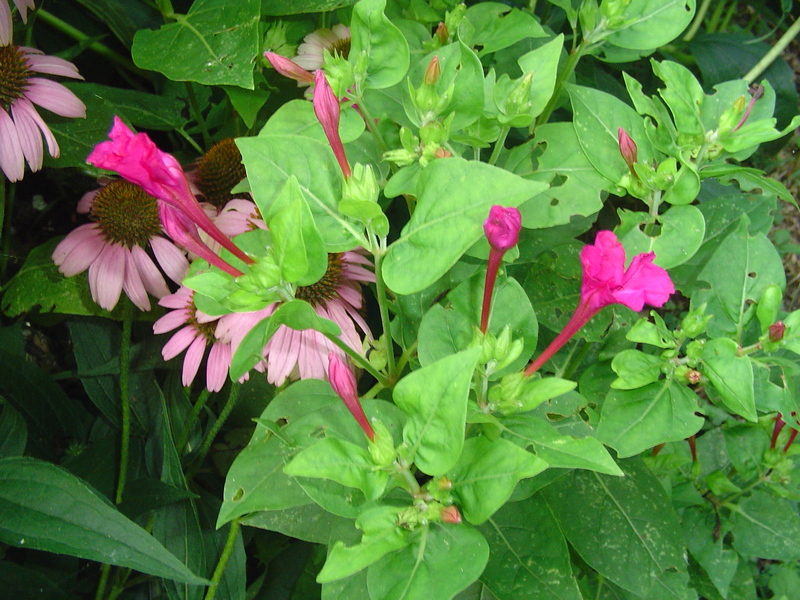 Four O’Clocks and Echinacea are favorite nectar plants for many different insects. 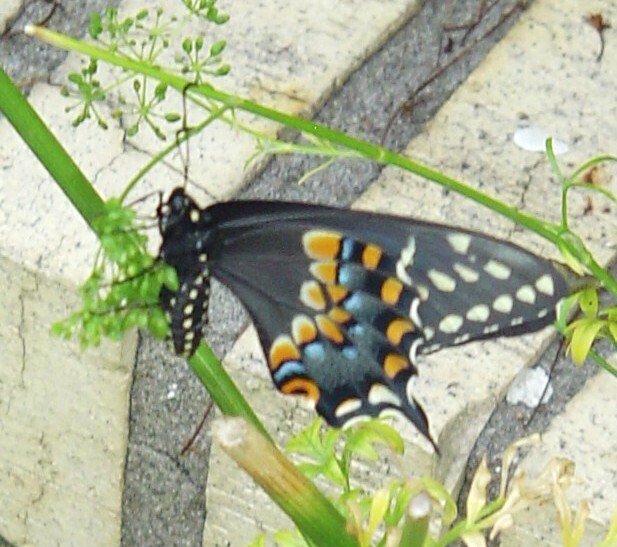 Host plants for the Eastern Black Swallowtail include parsley, fennel, and rue. 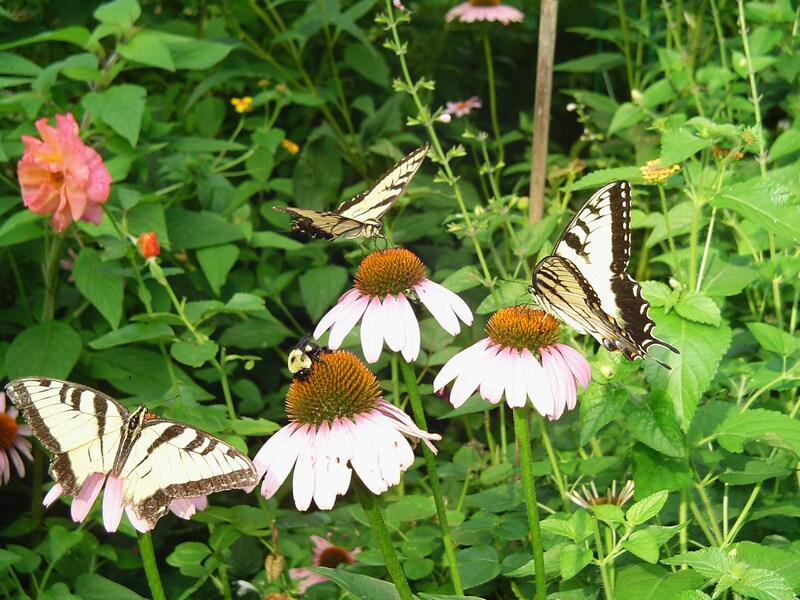 Learn more about which plants to include in a butterfly garden here and here. 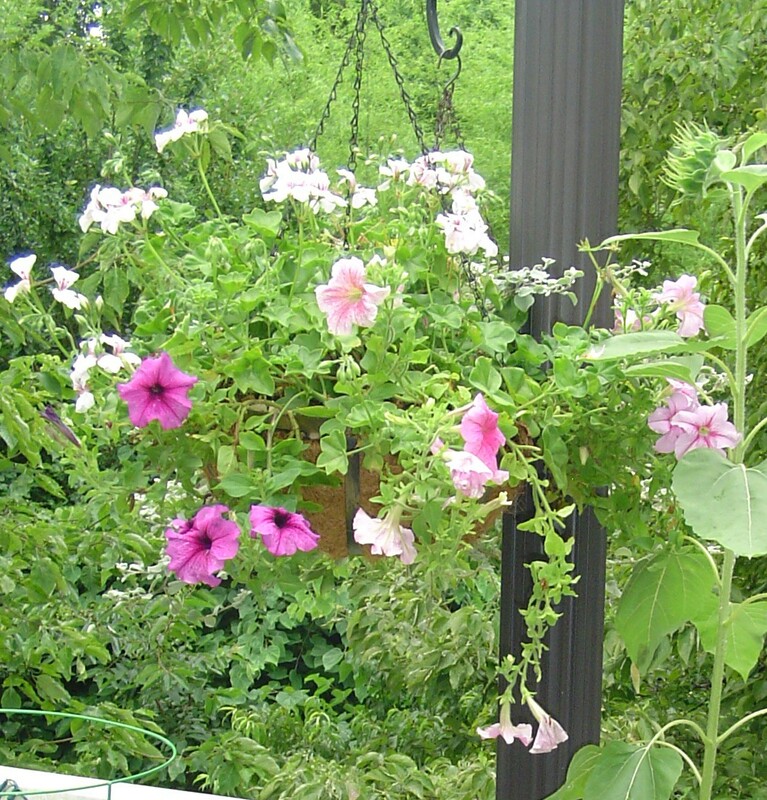 A hanging basket of petunias and geraniums draws butterflies to this deck garden. After hearing more and more stories in the news about declining populations of butterflies, bees and hummingbirds, it makes me very happy to see the butterfly population in our forest garden growing daily. Courtney Langley wrote an encouraging piece in our local Virginia Gazette about the abundance of Hummingbird moths and hummingbirds spotted in our area this summer. 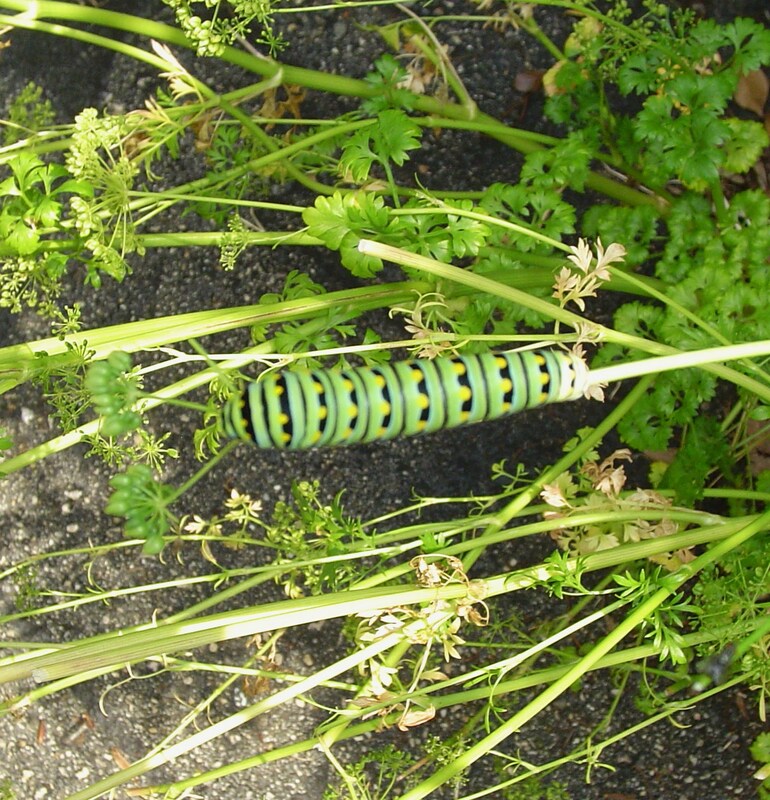 A beautiful caterpillar has been munching the parsley. He will soon join the butterflies living in the garden. 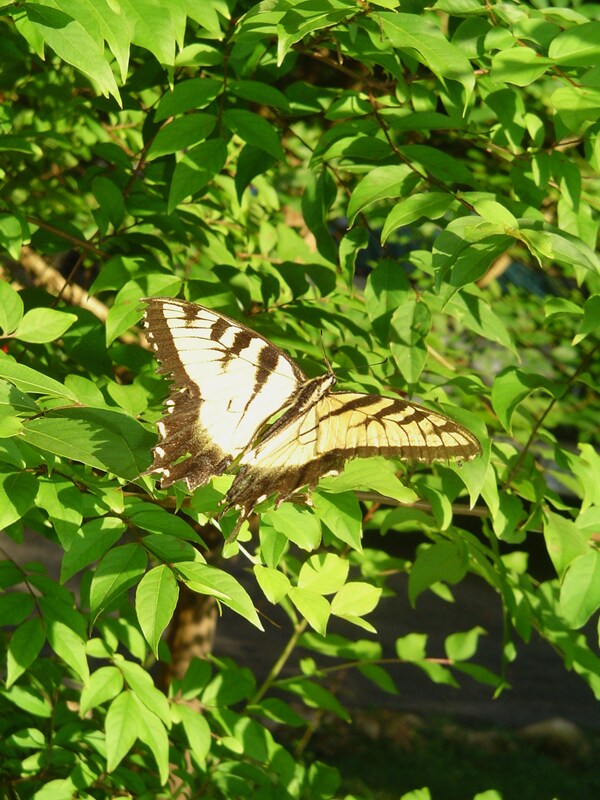 Eastern Tiger Swallowtail butterflies prefer laying their eggs on the leaves of trees, like the Tulip Poplar. 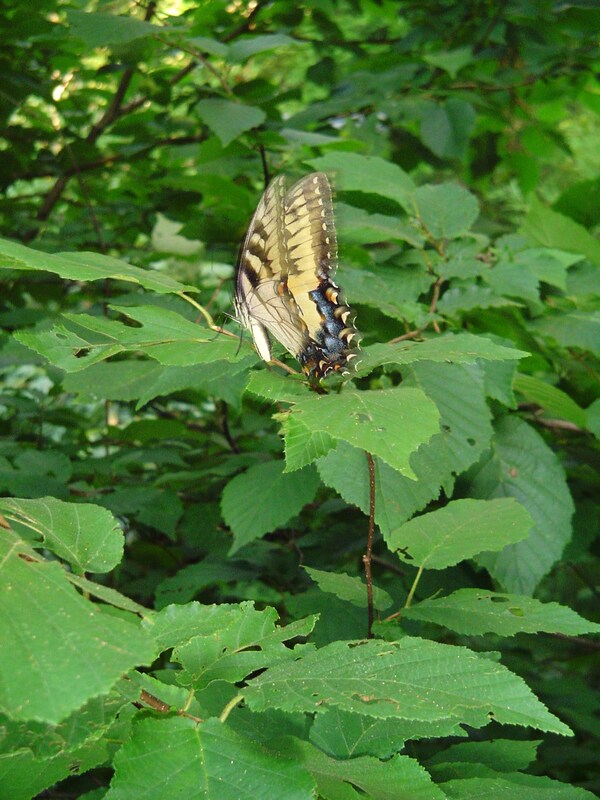 Female Eastern Tiger Swallowtail on a Hazelnut leaf. Maybe laying an egg? 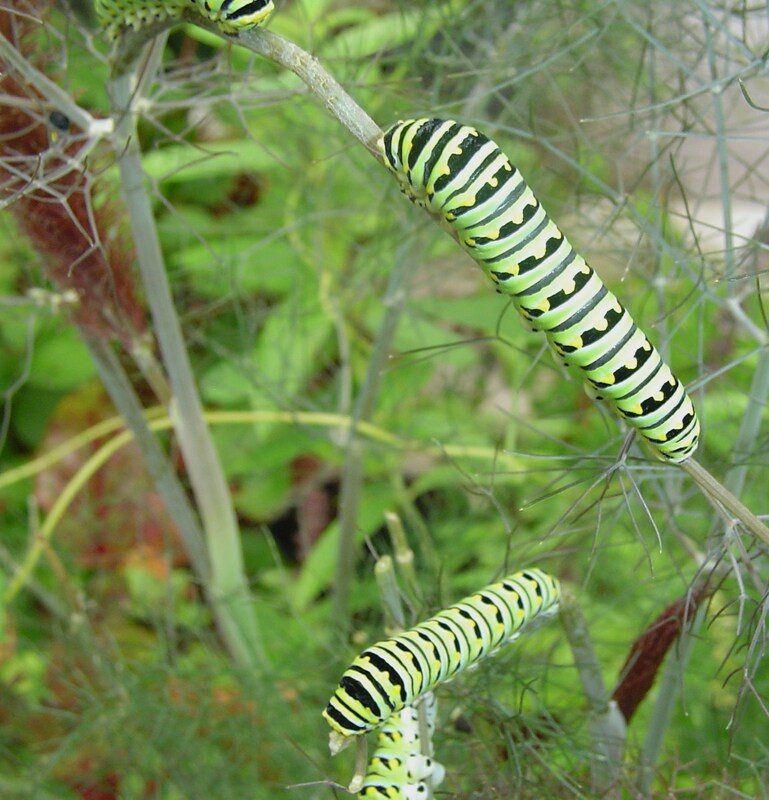 Once the tiny caterpillars hatch, they will eat from the host plants until ready to form their chrysalis. 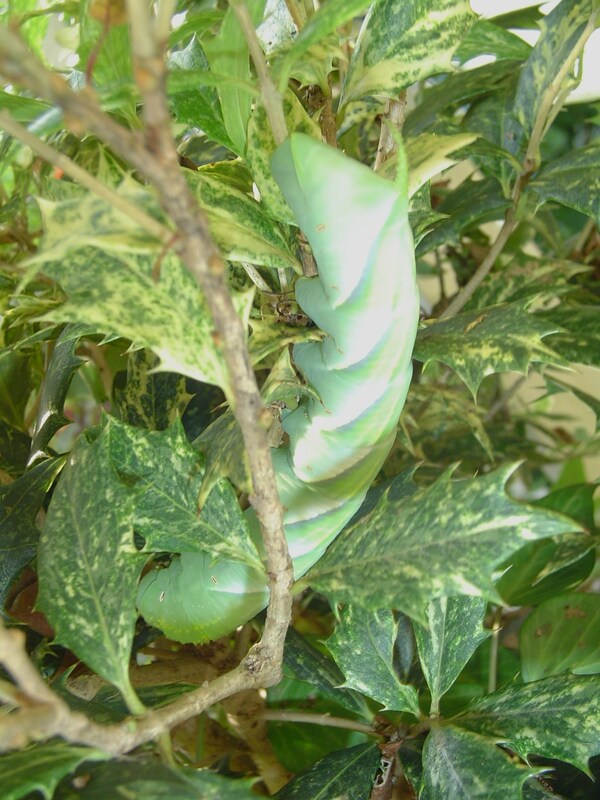 While in the chrysalis they neither eat nor drink, but will be ready to enjoy nectar once they finally break out and spread their wings for the first time. 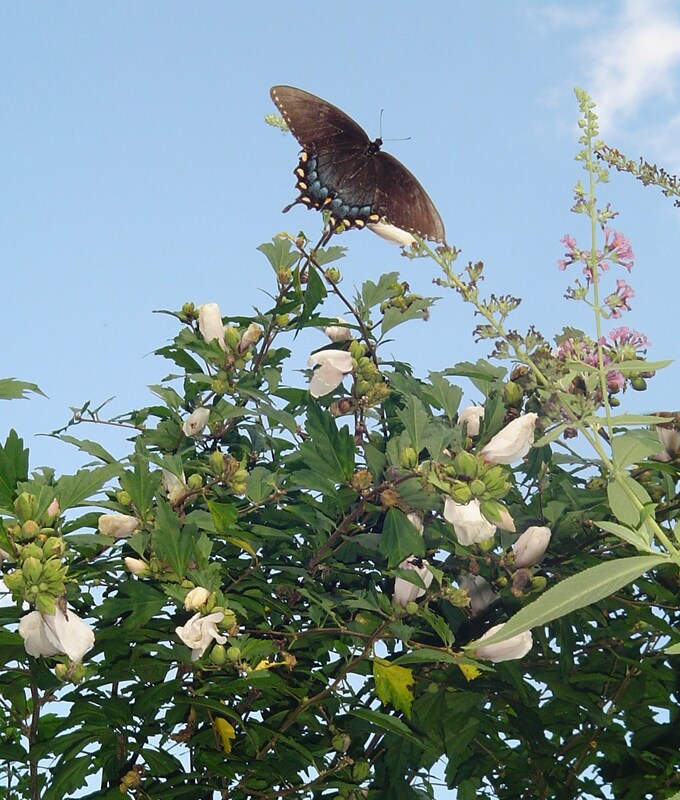 A male Eastern Tiger Swallowtail rests on a Crepe Myrtle tree. Whether your garden is large or small, it is important to never use pesticides in a wildlife garden. Cultivate a balance of plants, insects, birds, and other animals so that the cycles of nature keep problems in check. Never invite creatures to your garden, and then spray the very poisons which kill them. Organic gardening practices ensure that many species can live in your garden in safety, raise their families, and add to the beauty and health of your garden. 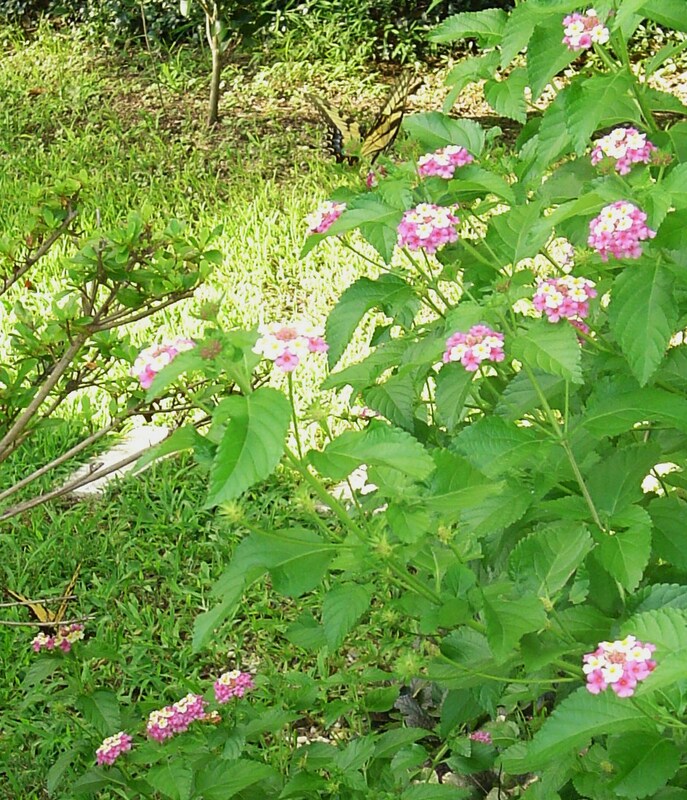 Lantana is a butterfly magnet, whether growing in a pot on the deck or out in the garden.